To me, Byrne’s FF is *the* FF. As far as I can tell, almost the whole Byrne run have been published in Finland and it was in full swing when I got into comics. Byrne’s tales with the family-feel of the group combined with the cosmic adventures in space and alternate dimensions are still pretty much the yard stick that I use to measure superhero comics. I guess that’s why I don’t much care for the darker stories. (My other superhero reading in my teens was Claremont’s long run in the X-Men.) I think the first time I read about the FF was when they beat Galactus. I have read some of the Lee and Kirby stories and they were published here in small black and white paperbacks a few years ago. However, I felt that they had aged badly especially with the blatant sexism aimed at Susan who was pretty much always in need of rescue. Byrne changed that. This collection gathers the first Byrne issues from FF 232 to FF 240. In the first story the villain Diablo sends four elementals to battle the FF. At the start of the story, we get a glimpse of the heroes’ ordinary lives: Sue getting a new hair style, Johnny on a date with Frankie Ray, Ben coming from the theater with Alicia, and Reed absorbed in his work. The elementals aren’t terribly hard to beat. The next story stars Johnny. He gets a letter from an acquaintance who had been recently executed for murder. Even though the man had been a criminal most of his life, he swears that he didn’t do this crime and asks Johnny to investigate. How could he resist? The next is a more cosmic two-part story. It starts with J. P. “Skip” Collins who lives an ordinary life. However, because he was subjected to an experiment during his days in the military, he has the ability to make everything he really wants to happen. He travels to New York and is there when a disaster hits Earth. The Fantastic Four do their best to help people and find out that the threat comes from space. They will, of course, confront those responsible. The next story is also a two-parter. It starts with the surreal notion of the all the FF living as ordinary people in Liddleville. They have no idea that they have super powers. However, Johnny, Ben, and Sue are having nightmares about their flight to space and about the cosmic radiation. The town has another not-quite-ordinary resident, too: Philip Masters who is also known as the Puppetmaster. In the next story Frankie Ray reveals her secret to Johnny. Also, a gang of thieves gives trouble to Reed and Sue because they have a strange member: a blue skinned woman who is three meters tall and able to tear apart a human’s mind just by looking at them. At the end, Reed tries to change Ben back to human. Unfortunately, it does change the Thing but not into a human. The next issue starts with Reed desperately trying to find out what went wrong while Aunt Petunia visits Ben. However, she’s come to the Baxter Building to get help: people in her small, Arizonan town are apparently dying of fear. But can even the FF beat such strange adversaries? In the last issue Quicksilver races to the Baxter Building looking for help; the Inhumans are plagued by a mysterious disease. Reed comes to the conclusion that even the Himalayans where their city Attila stands, is now too polluted for the Inhumans to live in. So, the city must be moved. The last issue especially is a classic one with the Inhumans’ move and the birth of Quicksilver’s and Crystal’s daughter. It's a great start for Byrne's long run. I really enjoy the family aspect of the FF. Ben as the irritable uncle, Johnny as the carefree youngster, Reed as the know-it-all scientist who has a tendency to put work before family, and Sue as the compassionate glue who keeps the rest together. They work together amazingly well. The FF usually has some guest stars, as well. Frankie Ray is the guest in most of the trade and I definitely enjoy the Inhumans and the rest of the (supernatural) cast. The villains are also, of course, half of the fun. However, this trade didn’t really have the most impressive villains; Diablo and the Puppetmaster aren’t that great. Dr. Doom made a surprisingly short visit. Overall: a good trade and the last story alone is worth getting it. By Mark Waid and a whole host of artists. I love Hitch and Neary’s art and they’re in a fine form here. The trade has three basic storylines: in the first one an evil Queen from fairy tales emerges to try to take her “rightful” place as the ruler of the world (and the most beautiful woman in the world, as well). Then there’s a brief story about Dr. Destiny and his apparently ability to change reality. Lastly, there’s a longer story where most of the JLA have been divided into their superhuman and civilian identities. The first story was clearly influenced by fairy tales, especially Cinderella and Sleeping Beauty but some of the others are dealt with as well. An unsuspecting woman reads an old book and so releases the evil Queen to modern Manhattan. She promptly uses her powers to turn the city into a magical forest and also sends her minions to terrorize the citizens. She sees Wonder Woman on the TV and believes that Diana is her ancient enemy – the only woman who is prettier than she. The JLA arrives quickly and the Queen kidnaps Diana. The rest of the team then tries to rescue her from the glass coffin where she sleeps. At the same time, they are trying to find a way to defeat the Queen. Many of them miss Batman’s skills and the team is starting to divide into two. The next story is quite short and is more of a staging ground for the start of the next story. The story starts with Superman telling about the case to Batman. He’s trying to convince Batman to return to the team by telling him how fractured the team had become. Dr. Destiny is causing trouble all over the world at the same time. However, the JLA knows that he is trapped in the Dreamstream. The team uses this knowledge to attack Dr Destiny in their dream forms. The next story starts when Batman finds a group of people from his Batcave: Clark Kent, John Johnson, Bruce Wayne… He calls in the rest of the team. It seems that the "civilian" people are convinced that they are the real JLA and are baffled about why they don't have their powers. Aquaman and Wonder Woman are the only ones without secret identities and they are also the only ones who aren't affected. Meanwhile, different people’s wishes come true all over the world. But the wishes have all been twisted somehow: a girl wishes a little bit of chocolate and the whole town is turned into chocolate; a homeless man wishes to be noticed and he’s given the power to change reality. The team has their hands full. Diana and Arthur are keeping a close eye on their team mates and they notice that the others are become more impatient and less human. I really liked this trade. Throughout, the team is struggling to come to grips with Batman's actions and there's even some character growth. I love the old fairy tales, especially the non-Disney versions of them, and the first story was mostly a real treat. Mostly, because I was a bit frustrated that the Queen's sole motivation was to be the most beautiful in the land. I know it's a classical motivation but still... Diana is so much more than just her looks. But I enjoyed the flying monkeys and the Hansel and Gretel dilemma poor J'onn had. It was also a great touch that J'onn, Arthur, and Diana weren't familiar with the stories (of course, since they hadn't grown up in modern society) while the Kryptonian who grew up in Kansas was. However, I was somewhat confused by the ending. I don't think that you can just swap an ordinary book for a magical one. I also loved the third story where we're shown how much the heroes need their more human halves. Overall: one of the best JLA trades I've read. 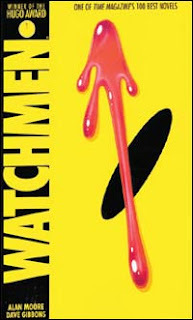 WATCHMEN is the graphic novel that completely changed the comic book industry forever. The book is a deconstruction of comics that forces a person to challenge the way they view life and the events that happen in the news. It’s also a great story. However, as good as it is, WATCHMEN isn’t a great piece of literature (though it comes close); there’s just too many comic conventions involved in both the art and story. Therefore, though WATCHMEN isn’t a great piece of literature, it is a great comic. Whatever the case, if you’re a fan of comics at all or have any interest in the history of pop culture, this is one graphic novel that you should definitely read. 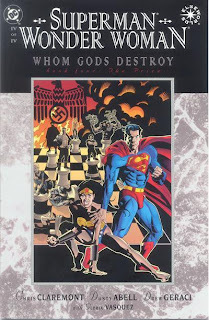 Set in alternative timeline where the Third Reich didn’t lose WWII and Germany and much of Eastern Europe is still under control of the Nazi regime against a backdrop that the gods, goddesses, and monsters of mythology are actually real and have returned to meddle in human affairs, the four-part SUPERMAN WONDER WOMAN: WHOM GODS DESTROY is one of the worst Elseworld stories I have ever read. Most Elseworld stories are kind of hooky, but charming with about as much substance as a dime-store novel. There have been a few Elseworld stories that are quite spectacular, e.g. RED SON. However, sometimes there’s an Elseworld story that attempts to be monumental but is in really just trash, such as SUPERMAN: AT EARTH’S END. 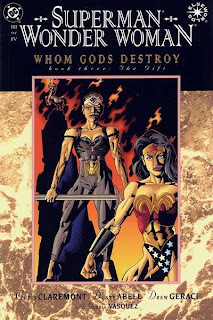 SUPERMAN WONDER WOMAN: WHOM GODS DESTROY is another. The basic plotline begins with an elderly Lois Lane is having nightmares about Superman going around the world and joyfully killing people. She confides in her BFF, Lana Lang. Meanwhile, Superman is living in semi-exile in his Fortress of Solitude on the moon. Old Supes discovered the hidden remains of the Holocaust a few years ago and went postal. He’s been banned from even the airspace of the Third Reich with a promise that his very appearance will be seen as a declaration of war from the U.S. Anyway, Lana Lang gets kidnapped and starts having some dreams that are even more bizarre than Lois’. Lois and Clark fly to Germany to discover what happened to their mutual friend, but along the way their plane is attacked by harpies. Yes, harpies. Superman rescues the plane, but when it lands Lois and Clark are taken into custody. They meet with one of the leaders of the Reich, Adonis. Readers eventually find out that the Greek gods of mythology have tired of staying out of human affairs and want to be important again and similar to the tragedy that was the Trojan War, they’ve decided to start a conflict. The stak es are high. Superman is bewitched by Circe and turned into a centaur; Lana Lang is given the power of the Oracle of Delphi and turns young; and when one of the Greek goddesses dies after a battle with the German army, she bestows all of her powers to Lois who becomes a new Wonder Woman. The original Wonder Woman has betrayed her brethren of Paradise Island and has joined the Nazis. That’s only the first half of the story. 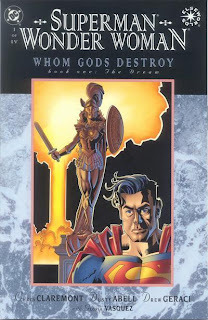 I read SUPERMAN WONDER WOMAN: WHOM GODS DESTROY because the basic premise of Superman and Wonder Woman fighting incarnations of the Greek gods was one I found interesting. However, I was appalled by the storyline in which the premise is delivered. The characterization of Superman is completely off wit h the Man of Steel behaving more like a troubled teenager than the hero he is. Then there’s the whole concept of the Third Reich still existing. Anytime a comic book has to fall back on a Third Reich that somehow won WWII and wasn’t defeated, you know the story is going to be bad. In fact, the only real reason I can see that this entire plot was brought about was so that Lois Lane, Lana Lang, and Superman could end up in a menage a trios. This series was written by legendary Marvel writer Chris Claremont. Claremont wrote some amazing stories for Marvel and the X-MEN, but he apparently didn’t know much about the DC universe. 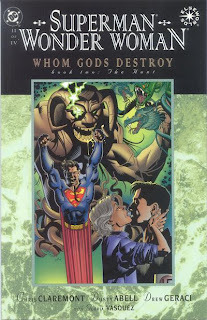 SUPERMAN WONDER WOMAN: WHOM GODS DESTROY is the second worst Superman story I have ever read, beaten out only by SUPERMAN: AT EARTH’S END. The only reason I can offer for reading this book is for the eerie prediction of Sept. 11th from Superman’s typewriter and Lois Lane’s nightmare in the first book of the series. Other than that curious trivia, there’s no reason to waste your time reading, let alone buying this comic book story. Recon Academy: Shadow Cell Scam by Chris Everheart, illustrated by Arcana Studio, 2009, 59 pgs, RL: 1.7 - Each member of the Recon Academy has been sold a fantastic new laptop but soon they discover they are ticking bombs. At the same time the Navy is launching a secret spy satellite nearby and the team has been too busy to provide any security but now they rush to save themselves and the satellite from the Shadow Cell. This book features on the lone female in the four member group, Emmi, whose special skill is martial arts. Very intricate, exciting story with an involved plot which is suitable for the publisher's recommended ages 8-13. The artwork is well done and reminiscent of what one finds in cartoon shows of this nature. The book is much harder to read than the 1.7 RL would have you believe with such phrases as "they're only prototypes", "time to decrypt their code" and "heat detection monitor". With my son's reading level we had to do shared reading, with me reading the harder words but the story was definitely a hit with him. He wants to read all four books. Fortunately we have one more at home, then we'll be off to the library! Recon Academy: Nuclear Distraction by Chris Everheart, illustrated by Arcana Studio, 2009, 55 pgs, RL: 1.9 - This book features Hazmat whose special skill is forensics but as we start off he participating in a karate tournament which Emmi has been training him for. They soon receive a call that there has been a security breach at a nearby nuclear power plant. The four member group is on their way and who do they find on the scene but the Shadow Cell. Here they are all put to the test, but Hazmat is put front and centre as he rushes straight into the danger alone where he uses his forensic skills, new found karate moves, faces close death and ends up with a date. A very exciting installment in the series. My son is anxious to read the other two books in the series. Once again though the book is much harder to read than the 1.9 RL would have you believe and with my son's reading level we had to do shared reading, with me also reading the harder words. I enjoyed the way the 'date' was handled. My son is 9 so this idea creeped him out. While the one boy with the date smooth talks about his upcoming evening there is an opposing character who "oh brother's" him all the time adding a comic relief for kids who are younger. This series is very suitable for a wide range of ages and would be perfect for older struggling readers. I'd recommend this right up to Grade 6. A harrowing depiction of what it was like to live through the destruction of Hurricane Katrina and the aftermath of that devastating event. Neufeld focuses on six very different people and their experiences before, during and after the storm. Shortly after the hurricane Neufeld spent time as a volunteer with the Red Cross in Biloxi, Mississippi. The blog entries he kept about that experience turned into a self-published book, which then morphed into A.D. I would suggest that anyone who enjoys this book find and watch When the Levees Broke, a HBO documentary film made by Spike Lee. It will blow you away. The majority of the stories in the trade center on Ra’s Al Ghul’s attack against the JLA. This is one of my favorite JLA trades. The trade starts with an almost Silver Age-type weird one-short. The Atom is helping doctors to perform eye surgery on a young man and finds that the infection is actually a colony of intelligent bacteria inside the boy’s brain. He enlists the help of the JLA so that they can try to persuade the aliens to move. The JLA shrinks down and travels to the boy’s brain. Wackiness ensues. Written by Dan Curtis Johnson and drawn by Pajarillo. I was a bit disappointed who very conservative the bacteria were. So, they look like bugs but their civilization is almost a straight copy of our own. Otherwise, it’s entertaining and the three last panels are especially weird. Then, the Tower of Babel starts with a bang when the Batman arrives to his parents’ grave only to find out that their bodies have been stolen. Then J’onn experiences a weird attack. Later, Flash and Wonder Woman are trying to extinguish a wild fire and find out, to their horror, that the flaming man in the middle of the forest is J’onn. They take him to the Watchtower and try to help him. Apparently, J’onn skin is covered with nanites that turn trace elements of his skin to magnesium and so, ignite his skin whenever his in contact with air. The JLA has no choice but to put him into a water tank. Then the Aquaman and the Plastic Man are attacked in the middle of a peace conference. The Plastic Man is frozen and then shattered. The Aquaman is subjected to gas that makes him mortally afraid of water. The Green Lantern woke up blind. The JLA is in disarray and the attacks against them only continue. Alas, the rest of the world isn’t in much better shape: it appears that people can no longer read. People are in panicking. Meanwhile, Batman is following the trail of Ra’s who took his parents’ bodies. When Batman finds Ra’s hideout, Ra’s offers to bring the Wayne’s back to life through the Lazarus Pit. As always, Ra’s goal is to pare down humanity to a manageable size so that the planet and nature can continue to exist. The story is fast-paced and full of surprises. Perhaps the JLA manages to overcome their problems a little too easily but otherwise the story is very entertaining. There’s even character development! There was a nice moment between Flash and Wonder Woman when they had a friendly race and the voting at the end was true to each character. I found the issue with Talia as the narrator to be well done and interesting. The short scenes between Batman and the other character were nice but perhaps a bit too late. There should have been more in the previous issues so that the final revelation would have had more sting. The epilogue consists of three shorter stories. One is about how Batman’s actions hurt the people around him. In the second story Batman is investigating a murder and all of his clues point towards… Superman. The third features Diana and Aquaman, and I felt it was very much out of character. Overall: Excitement, betrayal, angst, loss… very nice! This is my 12th review so I've now reached the Major level! The trade contains one issue about a superhuman prison riot, one issue about Hal Jordan angsting about being the Spectre, and the rest is devoted to the World War III storyline. I tend to like long storylines better and this is no exception. It’s not quite as good as Rock of Ages but it certainly has more characters and no time-hopping so I can fully understand why some people like WWIII more. In the first story, the super powered inmates at Belle Reve are rioting. Aquaman, the Green Lantern, Plastic Man and Zauriel have been sent to contain the situation but things are going worse quickly. Lantern loses his ring during a fist fight, and the inmates are killing wardens. Meanwhile, Orion and Mister Miracle tell the rest of the team that the big threat, Mageddon, has arrived. After the Hal Jordan-issue, the WWIII continues. Luthor has again gathered up his Injustice gang but the lineup is very different this time: Prometheus, the Queen Bee (who, despite how she’s drawn isn’t, you know, a mammal at all…), and the General in the body of the indestructible Shaggy Man. JLA, Orion, and Mister Miracle are in a war council about Mageddon, which is a weapon of the Old Gods and its nearness can first cause evil people to become violent, and later practically everyone to turn against each other. This is already seen on Earth where military budgets are rising and numerous countries are threatening to go to war against each other. In the middle of all this, the Injustice Gang invades the Watchtower. Meanwhile Metron, Wonder Woman, and Big Barda are travelling to Wonderworld which was last seen in the Rock of Ages. They are trying to find allies again Mageddon. Unfortunately, Mageddon managed to turn the powerful heroes of that world against each other and almost everyone has died. The trio returns to Earth only to see how badly people have been affected there, too. There are lots of things happening in the story and again the JLA has to break up to teams in order to deal with all of the crisis: stop the world leaders from bombing each other (and the Earth) to oblivion, to stop Mageddon, and to deal with the super villains. JLA also asks the help of every available super hero. In fact, there’s almost too much going on and no storyline gets the most time. There are a lot of fights in the trade but surprisingly, there’s even a little character development and very nice way to show the trust and friendship that is between Superman and Batman (which is ironic, of course, considering that the next trade is Tower of Babel. But with a different writer). There are also nice little scenes like the one between Batman, Huntress, and Prometheus in Prometheus’ tower, and in Heaven when Zauriel is asking for help from his fellow angels and, of course, the way that that help is given. I also quite enjoyed Prometheus vs. Batman round 2. Overall it’s a nice, long fight against deadly, cosmic level enemies. Not, perhaps, JLA at it’s very best but quite close. In Part I of this Elseworld’s story, the origins of Superman are reversed. 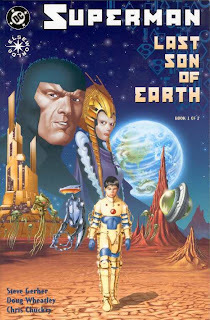 Instead of being sent from Krypton to Earth before the planet’s destruction, baby Clark Kent is sent by his scientist and engineer father, Jonathan Kent, into space as the last remnant of humanity before the Earth is destroyed by a meteor. The young baby is discovered and adopted by Jor-El. The human baby is similar to Kryptonians, but his structure is quite frail and he has to live in a bubble and as he grows a special suit is developed for him so that his body can withstand the immense gravity of the planet. Towards the end of the story, the tale takes on an evening more interesting turn as Kal-El (Jonathan Kent’s son) discovers a green power ring and becomes a Green Lantern. Using his newfound power he is able to stop the destruction of Krypton. Part I ends on a kind of cliffhanger with Kal-El having dreams that are actually his memories and he confronts his father, Jor-El about his past. The story concludes in Part II. Kal-El comes to Oa for training and to learn how to use his ring to unlock his unconscious memories. Upon learning the fate of his birth planet, Kal-El travels to Earth. Most of the planet has been destroyed by the giant meteor. However, though billions perished, there are millions that have survived and the largest city on the planet is now Metropolis. Lex Luth or has brought law and order to Metropolis, but any who oppose him are eliminated. There is a resistance against Luthor and Kal-El joins their forces. In coming to Earth, Kal-El has disobeyed the command of the Guardians. Earth already has a Green Lantern. Kal-El is torn because he doesn’t believe the Earth’s Green Lantern is doing enough, so he is faced with the choice of remaining on Earth and helping to rebuild that world, but giving up his position as a Green Lantern or return to Krypton as their Green Lantern and leave the people of Earth, the place where he is from. 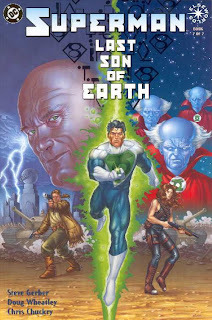 I enjoyed SUPERMAN: LAST SON OF EARTH PART I. It’s interesting how this story imagined the origins of Superman and combined it with Green Lantern’s origins. The art work is also visually appealing. The graphics are just as stimulating, but PART II isn’t as enjoyable as PART I. There was too much about the plotline that’s too convenient. For instance, Metropolis is the only major city left on Earth. Things could have been far more interesting if there was another city that had survived or if the city to have survived was another rather than Metropolis. For example, what if Gotham City was the only major city in America to have survived, but Bruce Wayne was dead and Gotham was controlled by Batman? This is eye candy to Avengers and JLA fans. Busiek manages to include every member of both teams at least once. The story is as silly as they usually are in these cross-overs. The being Krona (a blue-skinned man) is seeking truth about the birth of the omniverse itself and he doesn’t care how many universes he destroys during his quest. His probes are already sending beings from DC universe to Marvel and vice versa. The JLA are fighting Terminus while the Avengers battle Starro. The Grandmaster intercepts Krona and proposes a game: the Grandmaster will tell Krona who is the one being in the Marvel universe who has lived through the birth of the universe if Krona’s champions win. If Krona’s champions win, he will not destroy the Marvel universe. The champions are, of course, the Avengers and the JLA. Metron tells the Avengers that there are six objects from their world which are scattered throughout the DC universe and the Avengers must retrieve them. The Grandmaster tells the JLA the same thing. During the scavenger hunt, the teams get glimpses of each other’s world. Superman believes that the other world is in such grim place because its heroes haven’t done enough. Captain America is convinced that the JLA forces people to worship them. Of course, this leads up to big confrontation between the teams. The story isn’t as cheesy as it could have been, though, and I rather enjoyed the sequences that show what it could have been like if the teams had had frequent contact during the years. Most of the time, it’s pretty pure eye candy.